One of the biggest box-office smashes in Korean cinema history will debut on Blu-ray in North America this April. 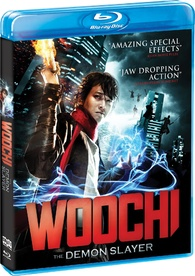 In an early announcement to retailers, Shout Factory will release 'Woochi: The Demon Slayer' on Blu-ray on April 9. This fantasy-action blockbuster based on a Korean folktale broke all box-office records in Korea in 2009. Jeon Woo-chi, an undisciplined, womanizing wizard unjustly accused of the death of his master, is trapped inside an ancient scroll until he is set free in 2009 by the wizards that imprisoned him to help fight against evil goblins that have taken over present-day Korea. The only problem is that Woo-chi is more interested in his new modern home – and the women of Korea – than becoming a hero. Will he be the savior of mankind? You can find the latest specs for 'Woochi: The Demon Slayer' linked from our Blu-ray Release Schedule, where it's indexed under April 9.